ah, home renovations. everything takes longer than you think, right? we’ve spent the last few months doing our due diligence working through the city of sacramento’s permitting process. and now? now, there are honest to god contractors climbing all over my house. carefully taking off the 95 year old molding and woodwork, inspecting the electrical wires and pipes, looking super official with very large tool belts. the house has really amazing bones. big closets. all that lovely built in wood. lots of natural light. but it needs a little help to be more of a modern house. the current kitchen? it’s two rooms. beyond retro. and completely closed off from the rest of the house. the second bathroom upstairs has a great cast iron tub . . . and the shower is in the second floor screened in porch. the back deck is an abomination. take a look. i mean, i guess it could be worse. but it is just such a waste of a view from the back yard. we’re going to get rid of all the busy stairs. instead, there will be two stacked decks. the lower deck will be a bit bigger and hopefully feel like part of the new kitchen. plus, the new deck will be made of real wood, not sad and crumbling fake wood. winning. speaking of the kitchen, it’s behind this wall. which is on the demo list. 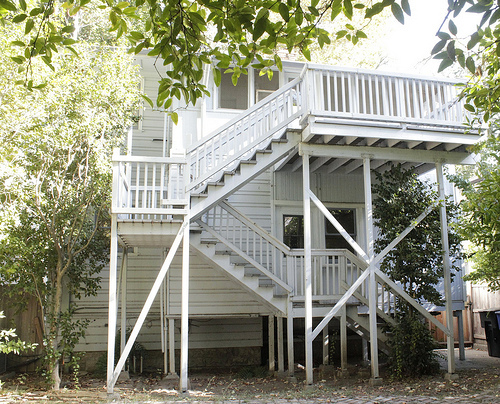 in its place, picture a lovely peninsula and an open view through the kitchen to the back yard. yes. 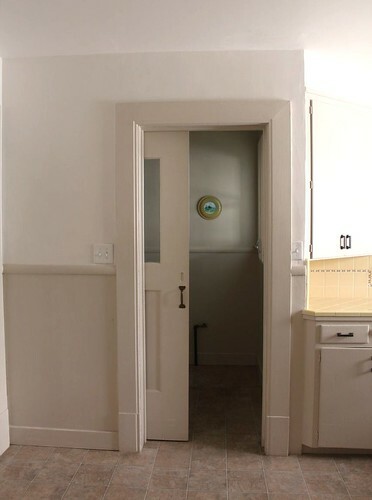 can you see that second doorway? that leads to the old oven closet. or scullery? old houses had kitchens and sculleries, right? who knows. in any event, no one puts baby in the corner and no one should hide the cook in the scullery. yeah, we are going to demo that wall too. 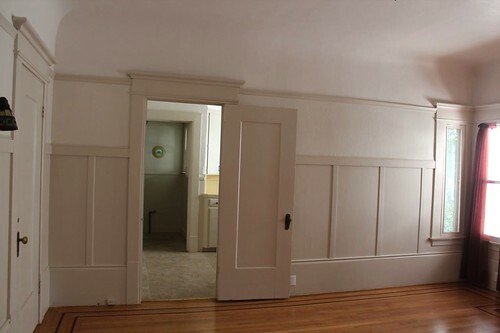 and that charming sliding door will get relocated, maybe to the new pantry around the corner. the pantry that will be approximately 500 times larger than my current food storage space. and which will hold so, so many rolls of paper towels. and probably oversized buckets of pretzels (i am kevin’s daughter, after all). jars upon jars of pb&j for the somm. it’ll be like i’m a prepper, but just this side of crazy. to the right of this photo is the kitchen. nice light. terrible floors. and don’t get me wrong. 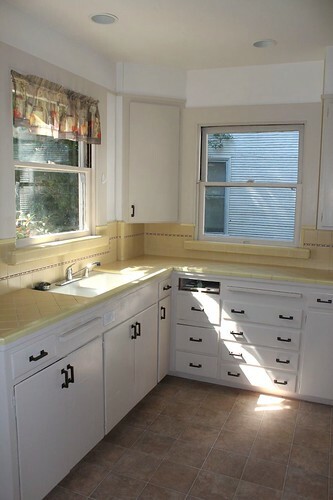 yellow is a great color for a kitchen. 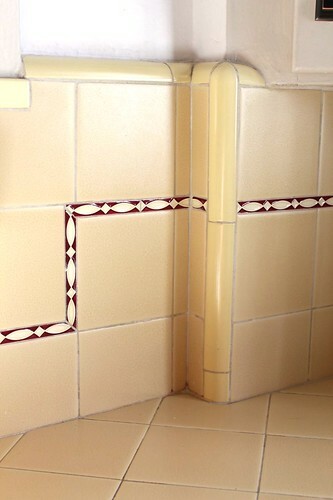 but that tile is intense. dark red accents? why not. it’s clearly a timeless combination. plus it has this raised border on the edge of the counter . . . i’m guessing it is super easy to keep clean and germ-free. ahem. those are pretty major projects. there are some smaller, more cosmetic ones that i’m trying to tackle without the contractors. 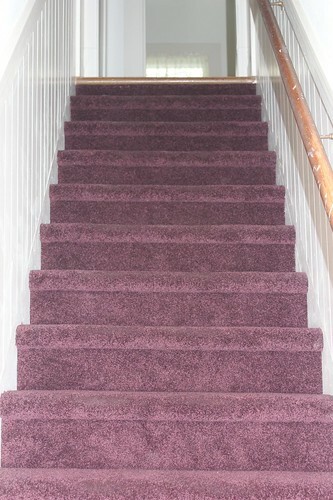 here is the purple carpet on the back stairs. in all its glory. i’m really hoping it was crazy on sale. know what is under that? perfectly lovely real wood stairs. i’m going to paint them and cover them with carpeting that doesn’t hurt my soul. i’m excited. the last owner was meaning well, i am sure. 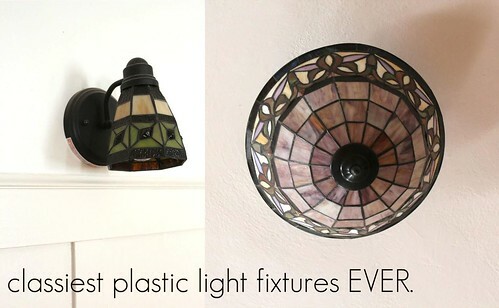 the faux tiffany fixtures are remotely historically accurate. but they are also plastic. and also give off barely any light. also, i may have done some serious damage at the lumen’s sidewalk sale last week. so fun. i can’t wait to go take pictures of giant holes in those walls. 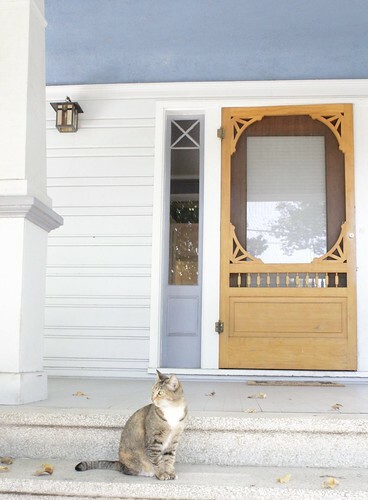 with that, i will leave you with a photo of our friendliest new neighbor. This entry was posted in Uncategorized by hilary924. Bookmark the permalink. Those stairs! Just, wow. I can’t wait to see what you guys do to the place! Great to see you last weekend 🙂 Love to you both. I’m kind of digging the purple stairs. 🙂 so much work but so exciting. I loved your blog, keep writing! Thanks for taking us on the renovation adventure with you! Can’t wait to see what happens…. Looks like a great house Hilary! Can’t wait to see the process!